Vincent van Gogh was a great admirer of Jozef Israels and we continually see many of Israels’ themes reflected in Van Gogh’s works. A remarkable example is this watercolour, which was painted around 1875. A good ten years later Van Gogh, inspired by Jozef Israels as mentioned in his letters to his brother Theo, painted his now famous ‘Aardappeleters’. 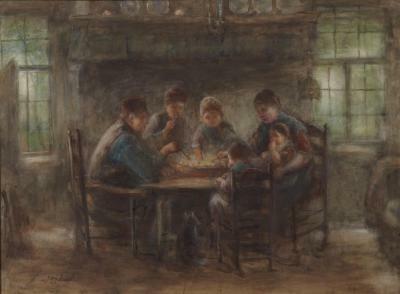 The work shows a peasant family at the dinner table. A large bowl of potatoes in the centre of the table is rendered as if just served out, still steaming. 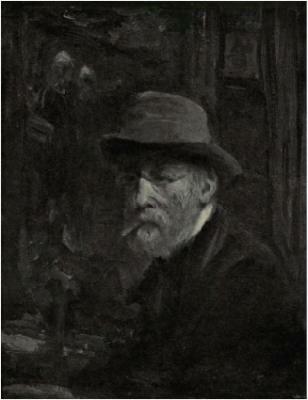 As one of the most important painters of the Hague School, his subjects concern often scenes of the lower class; the harsh life of farmers and fishermen. At a first impression this watercolour has a sombre atmosphere, describing the hard life of the portrayed family. However, the light through the window and the bright blue colour in their clothing give the scene an enjoyable character. Subtle highlights on the faces of the family members emphasize the intimacy of the scene. Jozef Israëls was born in 1824 in Groningen into a Jewish family and had a remarkable talent for painting and drawing from a young age. He received his first drawing lessons at the age of 11 and moved to Amsterdam in 1840, to study under the great master of that time, Jan Adam Kruseman. Israëls moved to Paris in 1845, where he enrolled at the Academie des Beaux-Arts. His work became eno . . .